Where do I cut my Dendrobium after it blooms? Look familiar? The most common type of Dendrobium available commercially are the myriad colored hybrids that have Dendrobium phalaenopsis in their pedigree. They have erect stems ranging from one to two and a half feet tall. Their leaves are carried on the upper half of the stem. 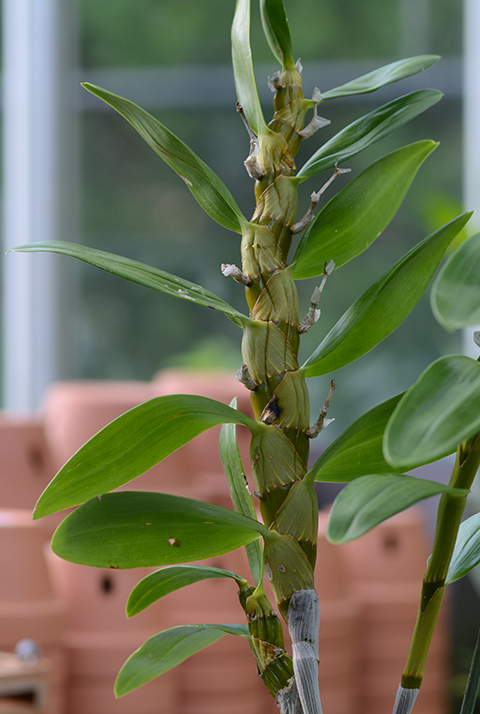 The Dendrobium pictured above is ready to have its spike removed. Notice that the flower spike originates near the apex of the stem just above the last leaf. 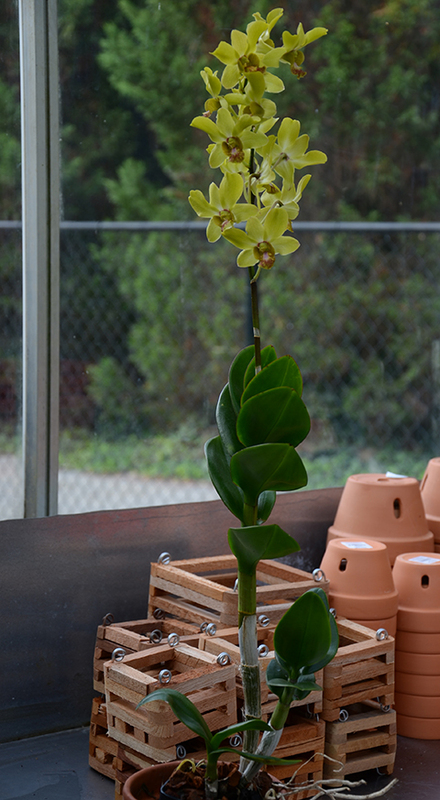 The spike itself has no leaves or bracts. After your Dendrobium has finished flowering remove as much of the spike as possible without cutting into the leafy stem. Check my earlier post for more about cutting tools. Old stems will not flower a second time, but DON'T remove them, at least not yet. Your plant needs them. A strong plant consists of minimum of three mature stems. The best time to remove surplus stems--typically the oldest stems that are leafless and yellowing--is when you are repotting. Once the plant is unpotted you can easily cut the horizontal rhizome that connects the upright stems and remove the portion with shriveled stems. I love the Dendrobium nobile hybrids like Dendrobium Red Emperor 'Prince' (above) --they are some of my favorites for using in our annual Orchid DAze display; and I'm pleased to see that they are becoming more popular and more common in the retail market. You may have bought one last year at our Gently Used Plant Sale. Notice that the Dendrobium nobile flowers are not carried on a single tall spike. Instead they are produced on short spikes of two to four flowers that appear at each node along the stem. It's easier to see the short spikes after the flowers have fallen (below). The short spikes turn an unsightly brown (see above) after the flowers have fallen, so I like to remove them with a razor blade, cutting as close to the stem as is reasonably possible. Dendrobium nobile and its hybrids are a bit trickier to grow than their cousins, the Dendrobium phalaenopsis hybrids--but they are SO worth it! 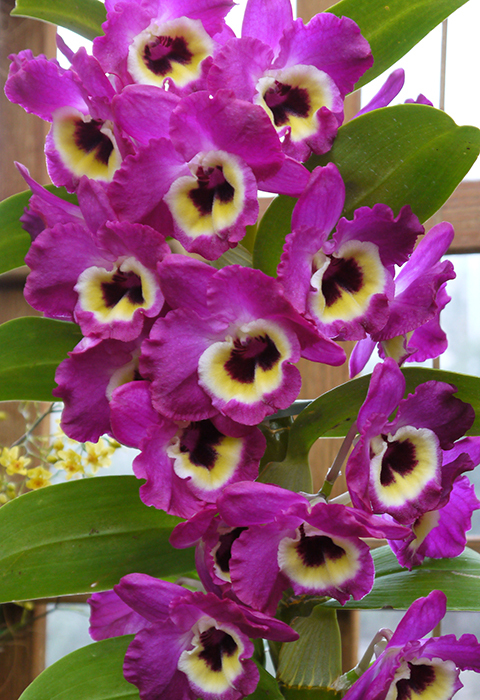 Check here for How to Grow Dendrobium nobile. 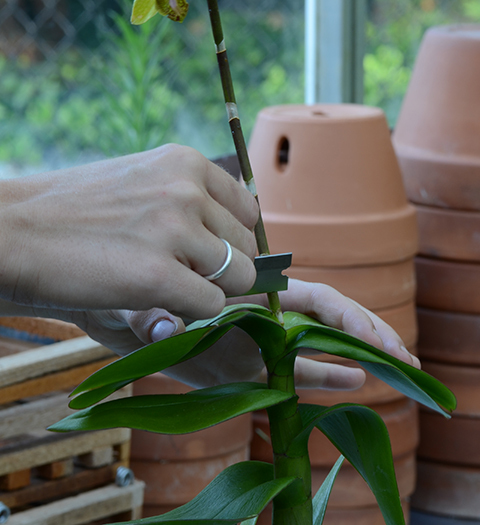 Wondering where to cut your Phalaenopsis spike? Find out here. click here to find out where to cut your Cattleya spike. 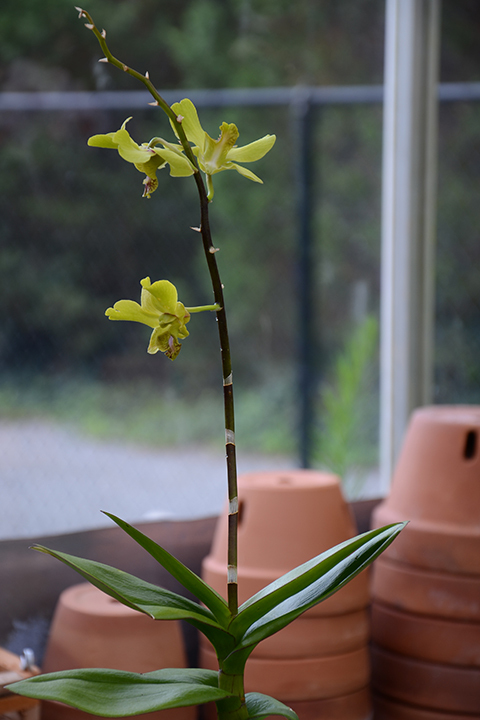 To find out where to cut your Oncidium spike, click here. I have a dendrobium macrophyllum that my hubby brought home and I was wondering if I should trim off some of what look like pods that are left iver without any leaves?